A simple and quick, noodle dish which makes the perfect mid-week recipe. This is meat free and takes just ten minutes to make. 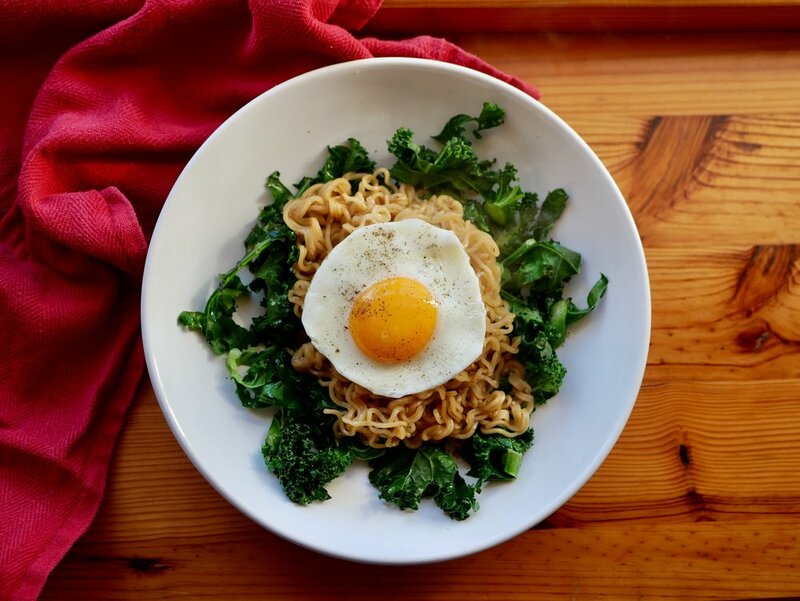 Packed with goodness, these noodles sit upon a bed of toasted kale topped with a fried egg. A great dairy free option for anyone who has an intolerance to dairy or lactose. This recipe uses egg noodles and eggs so isn't vegan friendly, however you can change up the egg noodles for rice noodles and the fried egg for toasted mushrooms. 1 Packet of instant noodles. 1. Pre-heat oven to 180'c. Place the kale on a baking dray with a drizzle of olive oil and pop into the oven to toast. 2. In a saucepan boil enough water to cover the noodles and cook for the time indicated on the packet - usually a few minutes. 3. In a frying pan add a drop of olive oil and once hot crack the egg into the frying pan to fry. 4. Drain the noodles. Once drained add the soy sauce, honey and sesame seeds into the pan. Take off the heat and cover. 5. In a deep bowl place the toasted kale - it'll be lovely and crispy. Pop the noodles on the kale and top with the fried egg. Season the dish with a little salt and pepper and enjoy.